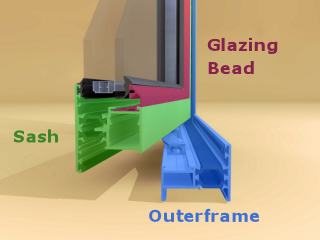 The glazing bead is the aluminium profile that secures the sealed units (or glass) into the aluminium window frame or opening vent. When inserting glass into a window system (often referred to as Glazing the window) the glazing bead and wedge gaskets are the last pieces of the window that you fix into place. Some windows are externally glazed (also known as “externally beaded”), while some are internally glazed (also known as “internally beaded”). Some window systems will use a mix of internally glazed and internally glazed sections within a single window. There have been many arguments over the years as to whether internally glazed or externally glazed windows are better for security. With people using arguments such as: “If you glazed a window from the outside then you can de-glaze it from the outside. Therefore externally beaded windows cannot possibly be secure.” Along with counter arguments such as “Internally beaded PVC windows can simply have their glass units forced in”. The majority of people in the industry once considered externally glazed windows to be less secure. This is simply due to the fact that internally glazed windows were developed, introduced and advertised as the more secure option. This is no longer the case due to the fact that the majority of externally glazed windows use modern technology, which means that the external glazing beads simply cannot be removed without removing the internal wedge gasket first. The simple fact is that both internally beaded and externally beaded aluminium windows are secure and the industry standard tests are there to prove it. Therefore if a window system can pass these tests they are deemed to be secure. So in the absence of any other even more stringent tests and standards, which should you choose, Internal or external glazed? Can make installation far easier by allowing the installer to fit the frame from inside the building, without the need for scaffolding. Once considered to be more secure than externally beaded windows, however due to modern technology and the strength of aluminium, externally beaded aluminium windows are just as secure. Externally beaded can provide a slimmer sight-line than internally beaded. From inside, the window may look neater as there are no bead lines. Often you will find that a window system will mix internal and external beads on a single window. This is generally due to the fixed lites being externally glazed. Windows that do not open (otherwise known as fixed lites) are generally glazed from the outside directly into the window frame. Therefore, a window which is made up of an opening sash next to a fixed pane - would be internally beaded on the opening vents and externally beaded on the fixed pane. This gives the best looks and slimmest sight-lines. If you wish to have internally glazed through-out your windows you would normally have to opt for dummy sashes or a double beaded window frame. 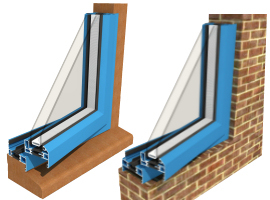 Dummy sashes provide equal sight-lines, as all the fixed lites are created by fixing opening vents into the outerframe, and are internally glazed. This information was taken from the Duration Windows Blog. 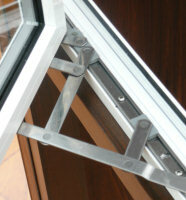 Scources include, aluminiumtradesupply.co.uk and double-glazing-forum.com. 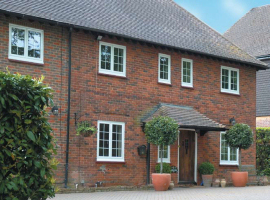 Our Premium aluminium windows offer high performance, security and slim-lines. 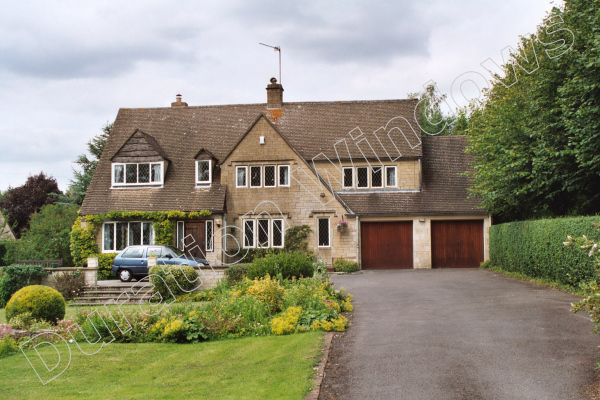 They are very thermally efficient windows, with many styles and designs to suit any home. Friction hinges provide added security over traditional hinges and allow the window to be held open in any given position. They also move across the window to allow for easy cleaning of your windows from inside. 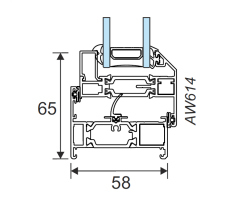 Our windows can be fitted with modern industry standard friction hinges, egress friction hinges for fire escape windows, or restrictor friction hinges for safety. Our products are all painted with a hardwearing polyester powdercoat paint, the paint is built to last and baked onto the aluminium. 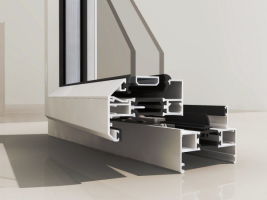 Our Premium aluminium windows are available in a standard white, black, brown, dark grey, dove grey and cream. You can also have you window painted in dual colour or any of over 200 single or dual RAL colour finishes. 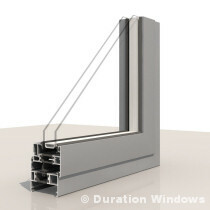 Using the natural strength of aluminium these windows are made to be nice and slim. As a result this window system provides more glass area and less frame, maximising light and solar gain into the property. 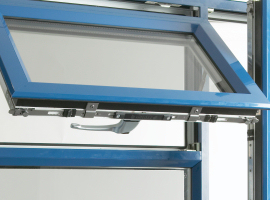 This window system can achieve sight-lines on fixed lites of 43mm and sight-lines on openers of 65mm. These windows come with a high security multi-point Trojan shootbolt lock, which also helps provide excellent compression. They are largely stainless steel in construction for strength & ultimate corrosion resistance. The lock consists of multiple espag locks with shootbolts top & bottom, providing increased security & tested to the equivalent of PAS 24 (BS 7950) for enhanced security. These windows are available with a variety of different outerframes, including a standard direct fix, ovolo, odd leg, equal leg and a square direct fix frame and provide a variety of options for different applications. This versatility means that this window system can be fitted into existing or new timber frames, or directly to the brick work. For your windows you can have either double glazed or triple glazed sealed units and choose between a wide range of different glass designs & glass options. You can have standard clear glass, square / diamond leads, georgian grills, astragal bars, patterned / decorative glass, obscure or textured glass. Other options include self cleaning glass, solar control glass and laminated safety glass. There is a selection of handles available for your windows, which are available in a variety of colours. With modern and period handles, to suit traditional or contemporary properties. These options include industry standard espag handles, basic cockspur handles and our Chelton handle range. The Chelton handle range consists of a modern Slim-line, an Art Deco and a classic Monkey Tail handle. These windows use some of the latest technology, such as an extra wide in-line plyamide thermal break & argon gas, to achieve window energy ratings (WER) as high as ‘A’ and U-values as low as 1.3 W/M²K. Our standard double glazed sealed unit for these windows is Planitherm Total+, with a warm edge spacerbar & centre pane U-value of 1.2 W/M²K, they exceed the Building Regs. Our Premium Aluminium Window system can produce a range of residential casement windows in many styles and designs. These windows are very thermally efficient, slim and strong, using some of the latest technology to provide the very best in security, performance and exceeding the building regulations. These exceptional windows are highly versatile and can be made to suite a variety of applications, with top hung, side hung and even bottom hung configurations. These windows are available in a wide choice of glass, colours and finishes, including dual colours. Our Premium Window range is available and a large range of profiles including flat, chamfered and ovolo designs to achieve traditional or contemporary appearances and is now also available with our Chelton® Handle Range. With our premium aluminium windows there is something to suit any home. They come in a range of styles and designs to suits any home. Large range of profiles includes flat, chamfered and ovolo designs to achieve traditional or contemporary appearances. 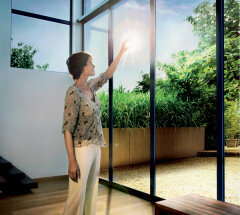 Slim-line using the natural strength of aluminium to give you more glass area and less frame. 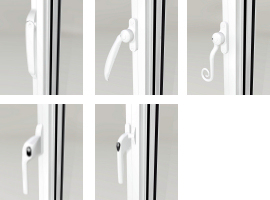 These windows use a Trojan shootbolt lock or our sophisticated Chelton Secure™ locking. They can be fitted into existing or new timber frames, or directly to the brick work. 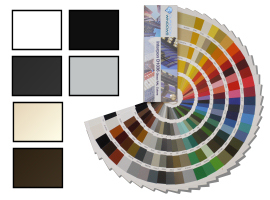 Large range of colours available including dual colours and over 200 RAL colours. Internal or externally beaded vents can be top or side hung. Superior Polyamide thermal break gives improved thermal insulation. These windows exceed the (Oct 2010) Building Regulations with excelent U-values and Window Energy Rating ‘A’, when you upgrade to our Premium Plus windows. 3D Configurator Find A Fitter Delivery Testimonials	Why Aluminium?